These were really fun to make!!!!! 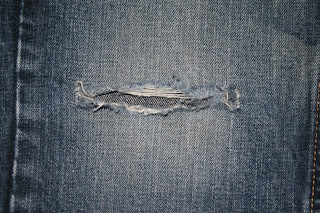 .....a pair of jeans with a hole in the knee. I love these jeans, but not the hole so I decided to do something to cover it. I didn't want to put a patch on them so I did an applique instead. 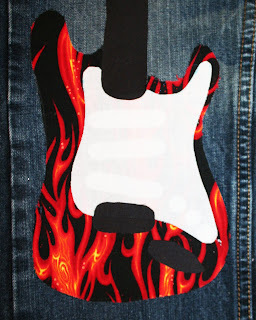 I googled guitar images and found one that i liked the shape of. My husband enlarged it and printed it out for me. I cut out each piece and traced it on fabric and fusible webbing. I cut them out and ironed the fusible webbing onto the fabric. 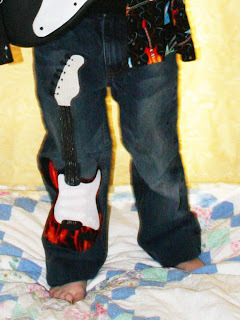 Then I pieced it all together on the jeans and ironed it down. Then I sewed around the edges of each piece. 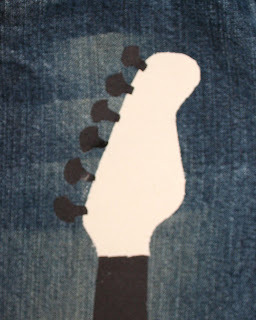 I used silver metallic thread to sew the strings. 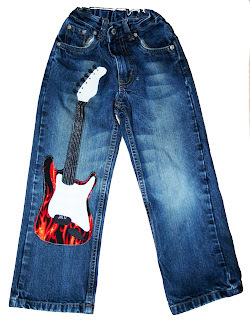 Now Dakota has an awesome pair of jeans!!!! And I didn't have to go buy another pair to replace the torn up ones. That is WAY cool! 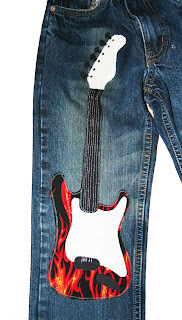 I have a hard time getting my sewing machine to sew inside the jeans - how do you do that? You have to open one of the seams. I open the outside seam because it's easier for me to sew back without being able to tell I ever did anything to it. 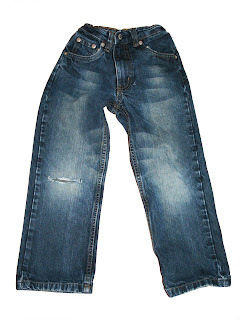 My kids have a few pair of jeans with holes in the knees. I need to give this a try! !